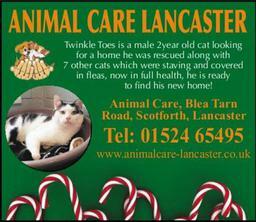 Animal Care has existed in various forms for over 30 years but as a registered charity since 1978. A few local animal lovers started to care for animals in their own homes when no-one else would help them and as the need for help increased so did the need for a permanent site to house the dogs, cats, rabbits, sheep, goats, horses and other animals desperately in need of care and attention. In 1987 Blea Tarn Kennels were kindly donated to the charity and since then the many volunteers and staff involved in the charity have helped improve the site so it is able to provide the best home until a forever home can be found for each and every animal. Animal Care has continued to grow and over the years has helped thousands of animals find happy forever homes. Animal Care can house up to 40 dogs, 50 cats, 20 rabbits, 10 ferrets and 30 rodents at any time.